There was a double Dutch delight in Latvia over the weekend following a one-two in the latest leg of the Unibet Open series. Rens Feenstra was the big winner in the €1,500 buy-in event, outlasting a field of 207 runners at the Royal Casino in Riga to walk away with a first prize of LVL 52,800 (around €75,000). For long periods of the final table it looked as if Feenstra's compatriot Rick Jansen would walk away with the title. Jansen had a healthy chip lead after eliminating Denmark's Jens Hansen in third place and extended his advantage still further early into heads up play. The balance of power shifted when Feenstra doubled up after rivering a flush with K2 to crush Jansen's pocket threes and it didn't take long for him to ride that momentum to victory. The tournament winning hand saw Jansen make a 120,000 raise from the button which Feenstra called. Afer Feenstra checked the 10d-2h-8h flop Jansen made a 120,000 c-bet which was raised. Not to be pushed off, Jansen pushed his final 1.5m into the middle. Feenstra made the call with 10-9 for top pair which was well in front against his fellow Dutchman's pocket fives. The turn and river were blanks giving Feenstra the title and his biggest tournament score to date. 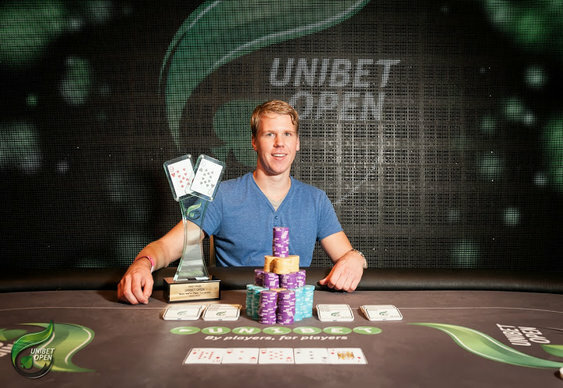 The Unibet Open heads to Copenhagen in the new year. Qualifiers for the Danish leg of the series are up and running at Unibet Poker. Image and hand details courtesy of Unibet Poker.